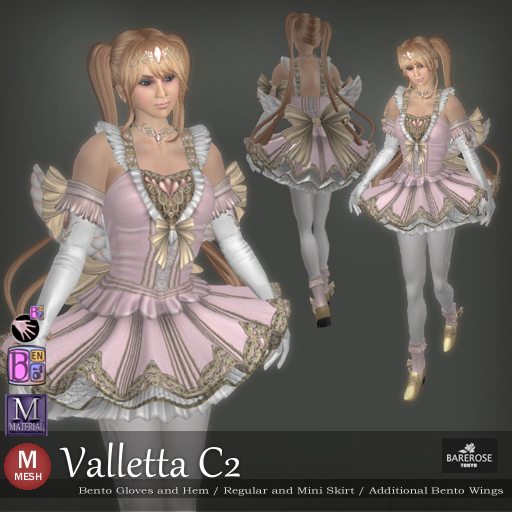 Valletta C2 is a new release from Bare Rose which features Bento support for Wings and gloves. Yes, that means you can do all you cute poses in a fabulous outfit now! So here is the grand looking Valletta C2 on Kitty and it looks cute from head to toe. There are 2 pairs of wings on the back, Bento supported. You could see if flaps in world. Here is a close up of the outfit and you can see that there is a cute tiara for the princess inside you and lots of royally colored golden ribbons to make this the perfect dress for any grand events! Remembered I mentioned Bento gloves? Here is a nice cutie Heart pose which proves that it is Bento! And as a bonus, you can also pick up the free Heart Pose here too, along other free gift! (And this place actually belongs to my friend and is one of the stops in the Kiyomizu Hunt mentioned in a previous post).